One of the most original big-budget movie companies of recent years has been struck with sequel-itis, or reboot fever. Although Pixar try to come across as master storytellers who are able to make the big bucks without compromising any of their vision, they arguably haven’t had much success with their throwbacks to Monsters Inc (2001) and Finding Nemo (2003). The respective prequel and sequel were disappointing in comparison to their predecessors, even if they still presented Pixar’s usual visual breadth and energetic pacing (and let’s not get started on the three Cars films). And now with another of their early 2000s films getting the reboot for nostalgic millennials, Incredibles 2 is certainly the most successful throwback since Toy Story 3 (2010). Changing up the dynamic of the Incredibles family with a role reversal, as Elastigirl (Holly Hunter) is sent to the city of New Urbrem to combat high-scale crime, while Mr Incredible (Craig T. Nelson) is left at home to take care of the kids. Throughout the entire film, but especially the action scenes, is where Incredibles 2 differentiates itself from most other superhero films by its use of ‘50s big band style music score and colourful imagery, which helps with its unabashed fun that is sorely missing from the vast majority of live-action “gritty” and colourless blockbusters. At home, Mr Incredible becomes a hero of his own, working hard to figure out how to take care of his lightning fast son Dash (Huck Milner), his daughter Violet (Sarah Vowell), who can make herself invisible, and most destructive of all, baby Jack-Jack, whose superpowers seem unending. 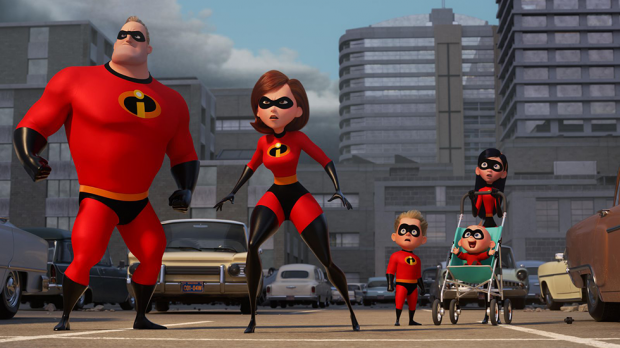 The handling of these two storylines shows Incredibles 2 can be amusing and can move the story forward, but it can’t do both at the same time. When it’s not being an immensely, nearly overwhelmingly entertaining ride showcasing the superpowers of Elastigirl in action or Jack-Jack running amok at home, it becomes a dull, uninspired slog when it sets its sights on tech billionaire Winston (Bob Odenkirk) helping the family to redeem themselves for the public, or on his helping-hand sister Evelyn (Catherine Keener), or on the mysterious screen-hacking mind-control hypnotist supervillain Screenslaver, none of whom have much characterisation to offer other than to spell out the plot to the Incredibles (and the audience). Pixar are playing things more safely here, never striking any cartoonish experimentation or melancholic power that they’ve had in their best work like Up, Toy Story 3, and Inside Out. Yet even what seems to be at half capacity for them, they’re still offering up a dose of popcorn entertainment that’s refreshing in an age of blockbusters that are muted in both cinematography and fun.